All Applications, Permits, and Forms may either be brought in to the Kay C Mackesey Administration Building or mail to the Village of Lake Delton P.O. Box 87 Lake Delton WI 53940. We do not accept faxed copies. After the application has been completed, submit both pages to the Village Clerk-Treasurer-Coordinator. Wisconsin Department of Revenue now offers a fill and print Renewal Form on their website see below link. Your complete premise discription may be too large for the space they provide on their form. If this is the case please type the complete premise despription on a single sheet of paper and attach to this form. ALL COMBINATION FERMENTED MALT BEVERAGE/INTOXICATING LIQUOR LICENSE ARE DUE IN THE CLERK’S OFFICE BY APRIL 15. Class C-Wine and Fermented Malt Beverage are due by May 1st. Class C-Wine application must also include sales figures for the previous year. To sell cigarettes/cigars/tobacco products with in the Village of Lake Delton Limits you must apply for a Cigarette License. A non-transferable and non-refundable fee of $100.00 must accompany this application. The license period is from July 1st to June 30th of the following year. Applications are due annually by May 1st. If you own a dog in the Village of Lake Delton you need to apply for an annual dog license and pay a fee by April 1st of each year. You must bring in Rabies Certificate from the Veterinarian that contains the Rabies shot Serial Number, Name of Rabies Vaccination Manufacturer. All licenses expire December 31st of every year. Application must be approved by the Lake Delton Village Board. Must be filed 20 days prior to the event. For all individuals/companies picking up garbage with in the limits of the Village of Lake Delton. A non-transferable and non-refundable $50.00 fee and $5.00 per vehicle fee depending on they number of vehicles must accompany this application. The license period is from July 1st to June 30th of the following year. Applications are due annually by May 1st. DNR Tonnage report for Prior year must be turned in by 3/31 annually. For all individuals/companies cutting and trimming trees with in the limits of the Village of Lake Delton. A non-transferable and non-refundable fee $50.00 must accompany this application. The license period is from July 1st to June 30th of the following year. Applications are due annually by May 1st. A Beverage Server Certificate or proof of registration in the Class must accompany all applications for new or provisional applications unless the applicant has been issued an operator License in Wisconsin in the last two years. Then you must submitt a copy of the previous held license with the new application unless it was held in the Village of Lake Delton. The license period is from July 1st to June 30th of the following year. Renewal applications are due annually by June 1st. Cabs, Taxicabs, auto-bus, limo or any other vehicle carrying passengers for hire within the Village of Lake Delton. The license period is from July 1st to June 30th of the following year. Applications are due annually by May 1st. A non-transferable and non-refundable fee of $250.00 per month or any portion thereof open for business must accompany this application. The license period is from July 1st to June 30th of the following year. Applications are due annually by May 1st. A request for a term license to erect a tent in the Village of Lake Delton for a period of not more than 1 week that used by person operating or conducting a retail business in a permanent building or structure conforming to the provisions of Chapter 57, and as the adjunct to the normal business or as approved conditional use who shall use and utilize one or more freestanding tent for merchandising or the display of merchandise. Tourist Lodging – Any place offered for rent to tourists or transients for sleeping accommodations including, but not limited to, hotels, motels, tourist rooming houses, cabins, cottages or short term rentals. Please read Municipal Code 35 (new 4/19/2018) for requirements for a Tourist Lodging Permit. STEP 1. Conditional Use Permit. (if applicable). You will need to apply with Wisconsin DATCP first, as your will need a pdf or jpg of your permit and inspection to attached to our online application. 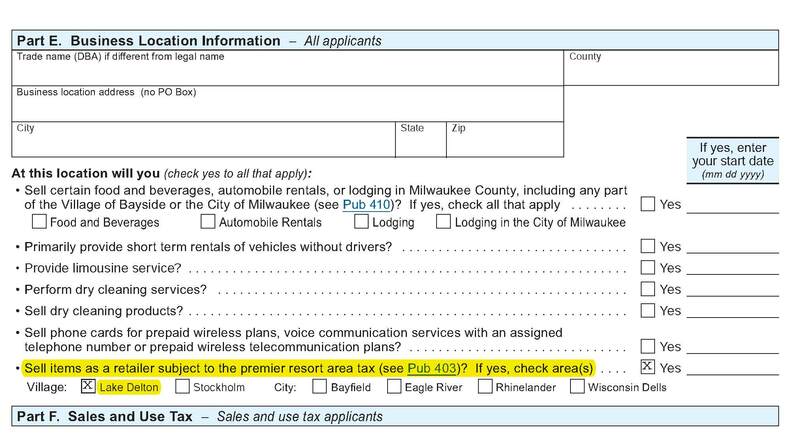 All Lodging Marketplaces to be utilized, including contact information, unit identification used by the Lodging Marketplace to identify the tourist lodging unit, copies of the rental agreements, and proof that the Lodging Marketplace shall utilize the Village of Lake Delton as the taxing jurisdiction. All tourist lodging shall be operated by the Owner or a Property Manager licensed, “operated” shall mean responsible for compliance with this Chapter 35, collection of rent, and payment of taxes. If the Lodging Marketplace doesn’t pay the Room Tax to the Village of Lake Delton you will be liable for that amount to the Village of Lake Delton. STEP 7. Site Plan including available onsite parking for the unit or rental house. All applications for Tourist Rooming House licenses must be filed by August 1st of each subsequent year. Every Tourist Rooming House operating license shall be for a period of one (1) year commencing on October 1, or the date of issuance, and shall expire on September 30 of each year. Partial Term Licenses for less than 12 months shall not be entitled to apportionment of fees. For those units with a fireplace please note: A Tourist Lodging Unit shall not have a wood or solid fuel burning stove or fireplace unless the Owner provides a certificate from a licensed commercial building inspector, fire inspector, or a verified statement from a reputable stove or fire place sales/installer entity, dated not more than thirty (30) days prior to submission, certifying that the fireplace and chimney have been inspected and are in compliance with National Fire Prevention Association Fire Code Chapter 211 Standard for Chimneys, Fireplaces, Vents, and Solid Fuel-Burning Appliances. Instructions for use of the stove or fireplace must be prominently displayed. A stove or fireplace not meeting the requirements of this section shall be blocked from access to the satisfaction of the Village Building Inspector. All stoves and fireplaces in multi-unit buildings must be blocked from access to the satisfaction of the Village Building Inspector. The owner or operator of every Transient Employee Housing unit shall maintain a register and require all occupants to register their true names and addresses before being assigned sleeping quarters. The register shall be kept intact and available for Inspections by the Assistant Zoning Administrator, or representatives of the Village, for the duration that they hold a license in the Village of Lake Delton. Detail floor plan of unit or rental house with measurement of each room. Property Management Agreement if not managed by Owner. Authorization from Owner (if owner is not applicant). Authorization from Condominium Association (if applicable). Site Plan including available onsite parking. All applications for Seasonal Employee Housing Licenses must be filed by May 1st of each subsequent year. Every Transient Employee Housing License shall be for a period of one (1) year commencing on July 1, or the date of issuance, and shall expire on June 30 of each year. Partial Term Licenses for less than 12 months shall not be entitled to apportionment of fees.